Oceana offers freedom for families with age-specific kids’ clubs, a night nursery for under 4s and dedicated family restaurants and early eating times, creating the perfect balance for families. So you can enjoy quality time together as well as time separately. Enjoy delicious dining, dazzling entertainment, cocktails on the terrace, casino and celebrations in the Champagne bar. There’s also plenty of places to relax and unwind including a luxury spa and salon. 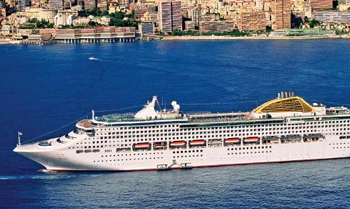 View all Oceana cruises or view more options for P&O UK cruises. There’s also the opportunity to visit the Select Dining venue, Café Jardin, offering a contemporary Italian-inspired menu. Take in beautiful paintings, prints and sculptures by artists around the world. Oceanas art gallery features works by both famous and up and coming artists, and many of the works are for sale if something catches your eye. Conveniently located just forward of the aft lifts, on the port side of Lido Deck, is the stylish Oasis Salon. When you want to look your best or just feel like treating yourself to a little pampering, visit Oceana’s full-service hair salon for a cut, colour or styling. Indulge yourself, and let us coddle you – our professional staff is warm and welcoming and ready to transform you. Situated midships on D Deck, and adjoining the Monte Carlo Club, is Winners’, Oceana’s aptly named sports bar. This brightly coloured bar has a casual yet buzzing atmosphere and is the perfect place to count your winnings from the Monte Carlo Club casino. Winners’ full-service bar is bound to serve your favourite tipple or help you discover a new one and its large comfortable chairs offer a welcoming break from the gaming tables. There are plenty of daily activities on board to keep you busy with bars, pools, sports venues and shops, or you can sunbathe on deck with a good book and relax by the pool. Fun and relaxed, this superliner has a ‘wow factor’ all her own. Endless diversions and an informal atmosphere beckon on board. You can play a game of five-a-side or tennis in her sports court, ingeniously housed within her funnel. Peruse the shops in Regent Street. Luxuriate in a jacuzzi. Surf the net or email home in Explorers. And tone your body while you soothe your mind in the ocean-view gymnasium. If you prefer to keep evening arrangements flexible, opt for Oceana’s Freedom Dining. Allowing you to dine in the inviting Ligurian Restaurant when and with whom you choose, it is perfect for Oceana’s sociable crowd. If you prefer really getting to know your table companions, opt for Club Dining. And of course Oceana’s Select Dining venues offer variety and a change of scene. Dine beneath the stars at her Horizon Grill or opt for bistro style fare in The Plaza. Round your day off with a drink in one of her many bars, let your hair down in Le Club, or enjoy a romantic stroll on deck. A superliner suited to many tastes, she is the perfect choice for families and newcomers. Boasting high-tech audio, video and lighting equipment, the Footlights Theatre sets the scene for musical extravaganzas in superb style. This amazing lounge offers ocean views through floor-to-ceiling windows and boasts an ingenious stage. The dramatic design of this room, with its amazing lighting system and fibre-optic inlaid dance floor, provides an evening experience like no other. In the casino you’ll find the latest in the world of slot machines. There is also Three Card Poker, Blackjack, Bingo, Video Horse Racing, Roulette, and Fun 21 which is a variation of Blackjack.